Hundreds of grieving relatives prayed Tuesday at the spot where a Lion Air jet plunged into the sea as revelations over the jet's malfunctioning air speed indicator raised fresh questions about the cause of the accident. 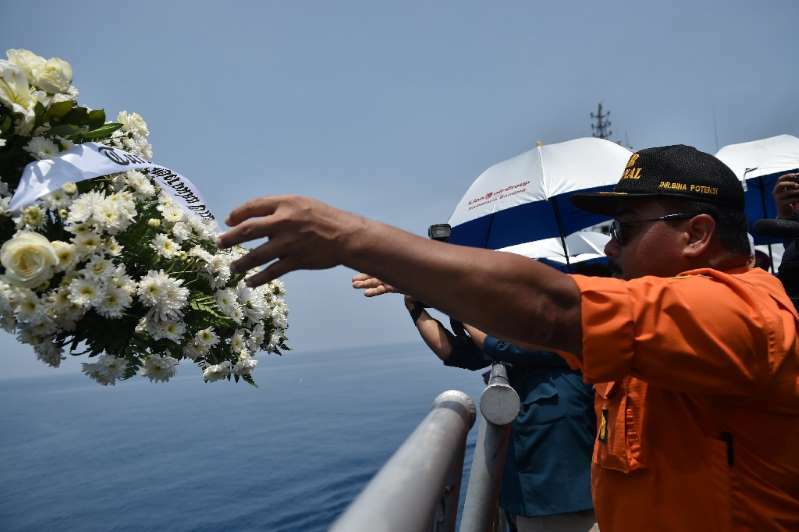 Tearful mourners aboard a pair of Indonesian navy vessels tossed bouquets and scattered flower petals into the Java Sea off the country's north coast where the brand new jet crashed last week, killing all 189 people on board. Search teams have filled some 164 body bags with remains found after the devastating crash, but only 27 victims have been identified so far, police said. The Boeing 737-Max 8, one of the world's newest and most advanced commercial passenger planes, crashed on October 29 just 12 minutes into a one-hour flight from Jakarta to Pangkal Pinang city on Sumatra island. Flight JT610 sped up as it suddenly lost altitude and then vanished from radar shortly after take-off. Divers have retrieved the flight data recorder but are still hunting for the plane's cockpit voice recorder. There is still no answer as to what caused the crash, with a preliminary report expected at the end of the month. But the Indonesian National Transportation Safety Committee said Monday that flight recorder data has so far revealed the plane's air speed indicator was not working properly on its last four journeys, including the fatal flight. "The technical problems on the three previous flights should have been treated as a repeat problem that cannot be fixed the same way each time," aviation expert Alvin Lie told AFP. A more thorough check should have been done followed by a test flight before the plane was put back into service, he added. "The air speed indicator is a part of vital flight instruments. If it's broken then it's a 'no-go' for the plane," Lie said. Gerry Soejatman, another aviation analyst, said finding the cockpit voice recorder was critical for knowing how the crew reacted to the malfunction and what role it played in the crash. "The air speed indicator plays a very important role, but (that) alone is not enough to cause a plane to crash," he said. It is not clear how much training the Lion pilots had on the new jet -- which only went into service in August -- or whether the problems could affect other Boeing 737 MAX planes. Budget carrier Lion has been plagued by safety concerns and customer complaints over unreliable scheduling and poor service.